This module makes use of the Severalnines repository for yum and apt packages. This repository hosts the latest stable release of ClusterControl and all of its components. ClusterControl and all of its components requires post-installation procedures, like setting up MySQL, granting users, setting up Apache and etc. This module will automate most of these. clustercontrol - Severalnines ClusterControl Web Application. Frontend for clustercontrol-controller. Previously known as cc-ui. clustercontrol-cmonapi - Severalnines ClusterControl REST API. Previously known as cc-cmonapi. The Severalnines Repository installation instructions are available at http://repo.severalnines.com and explained in details in this blog post. 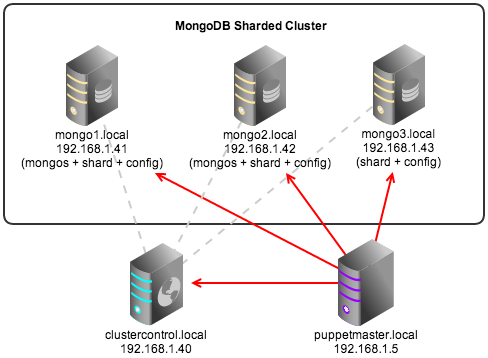 We’ll now show you how to deploy ClusterControl on top of an existing database cluster using the ClusterControl Puppet module. The node for ClusterControl must be a clean/dedicated host. ClusterControl node must be running on 64bit OS platform and together with the same OS distribution with the monitored DB hosts. Mixing Debian with Ubuntu and CentOS with Red Hat is acceptable. ClusterControl node must have an internet connection during the deployment. After the deployment, ClusterControl does not need internet access. Make sure your database cluster is up and running before doing this deployment. **Please review the module’s requirement available at Puppet Forge for more details. ** This step is compulsory. The above command will generate a RSA key (if not exists) to be used by the module and the key must exist in the Puppet master module's directory before the deployment begins. ** Copy the generated token and specify in the node definition under api_token. As illustrated in the above figure, we have a three-node Percona XtraDB Cluster running on CentOS 6.5 64bit. The SSH user is root and the MySQL datadir is using the default /var/lib/mysql. Or, wait for the Puppet agent service to apply the catalog automatically (depending on the runinterval value, default is 30 minutes). Once completed, open the ClusterControl UI page at http://[ClusterControl IP address]/clustercontrol and login using the specified email address with default password ‘admin’. Take note that this module will install the RSA key at $HOME/.ssh/id_rsa_s9s. Details of this in the Puppet Forge readme page. 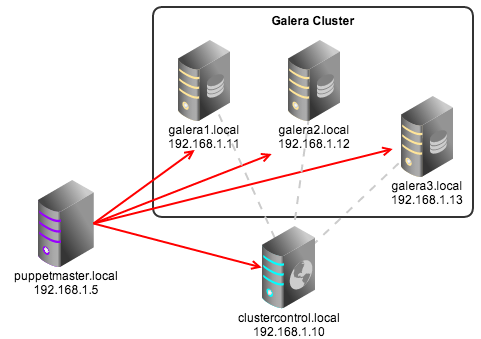 For MySQL Cluster, extra options are needed to allow ClusterControl to manage your management and data nodes. You may also need to add NDB data directory (e.g /mysql/data) into the datadir list so ClusterControl knows which partition is to be monitored. In the following example, /var/lib/mysql is mysql API datadir and /mysql/data is NDB datadir. The MongoDB Replica Set runs on Ubuntu 12.04 LTS 64bit with sudo user ubuntu and password 'mySuDOpassXXX'. 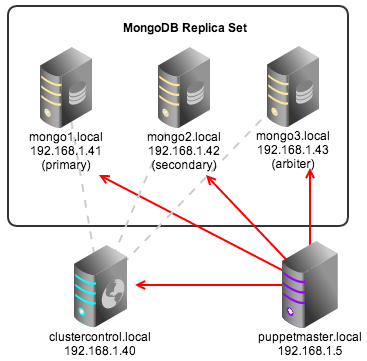 There is also an arbiter node running on mongo3.local. In MongoDB, the module does not require mysql_cmon_password and mysql_root_password which specifically for MySQL granting. 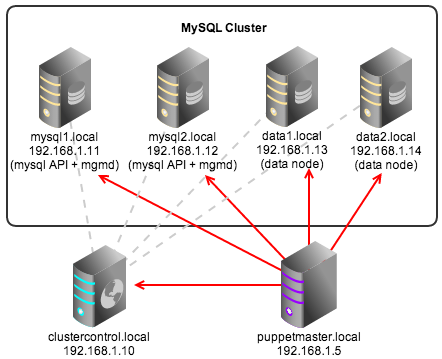 Please have a look at the documentation at the ClusterControl Puppet Forge page for more details. In our upcoming post, we are going to elaborate on how to deploy new database clusters with ClusterControl using existing modules available in Puppet Forge.